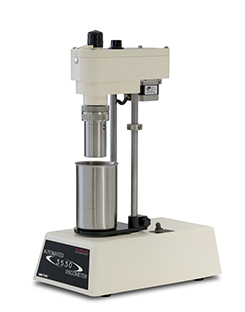 The Model 3530 is a fully automated concentric cylinder viscometer designed to meet API and ISO requirements for viscosity measurements of many of the fluids used in well servicing. This viscometer is fully operational in manual mode without the use of a computer or as a computer controlled viscometer with preconfigured periodic shear rate ramping. The Rheo 3000 Data Acquisition Software is provided with the instrument and provides a powerful tool ensuring consistent testing parameters and results. The Model 3530 is an automated version of the Model 3500LS+ viscometer combined with our powerful Rheo 3000 Data Acquisition Software running on your computer (Software is an optional/additional feature). This combination provides complete, programmable control of the viscometer's speed throughout a test cycle including step changes, linear ramps and constant speeds as low as 0.01 rpm. Rheo 3000 also provides automatic data acquisition graphical displayand analysis of the test results. All test data is stored in a spreadsheet compatible file format for ease of data handling.